Shares of the gaming and artificial intelligence leader got some love from Wall Street. Shares of graphics chip specialist NVIDIA (NASDAQ:NVDA) jumped 9.4% to close at $203.00 per share on Tuesday. For context, the S&P 500 and the tech-heavy Nasdaq both closed the day up 1.6%. After October's rout, Tuesday's move brings NVIDIA stock's return back into positive territory for the year. 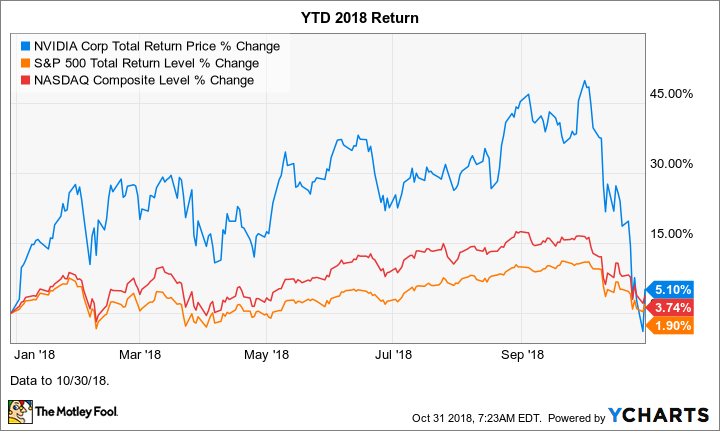 Shares have returned 5.1% so far in 2018 through Oct. 30, versus the S&P 500's 1.9% return and the Nasdaq's 3.7% return. We can attribute NVIDIA stock's Tuesday spike to the JPMorgan analyst who covers the stock. Before the market open on Tuesday, he upgraded his rating on the stock to overweight, from neutral. Along with the upgrade, he lowered his price target to $255 per share, down from $265. At first glance, those two moves might seem contradictory, but they're not in light of the market action in October. Along with chip stocks and large-cap tech stocks in general, NVIDIA stock has taken a particular beating this month, as the chart below shows. Prior to the JPMorgan upgrade, the stock was nearly 36% off its all-time closing high of $289.39 per share, set on Oct. 1. (After Tuesday's boost, shares are still nearly 30% off that all-time closing high.) Taken together, the analyst's moves are saying that he thinks the sell-off in NVIDIA stock is overdone, and that shares are a good buy at the current price. I resoundingly agree, but he's shaving $10 off his one-year price target simply because the stock now has a bigger climb to make up for its big drop in October. The JPMorgan note acknowledged that NVIDIA's gaming business is facing some near-term challenges -- including an excess of gaming graphics processing unit (GPU) inventory in the sales channel -- but that the longer-term story for gaming remains bullish, thanks in part to the growing popularity of e-sports and the upcoming release of many new game titles. Moreover, the note called out NVIDIA's long-term opportunities across its other businesses, too, according to multiple published reports. These include data center -- which has been experiencing torrid growth driven by the rapid adoption of artificial intelligence (AI) and growth in high-performance computing (HPC) -- professional visualization, and auto, which has tremendous upside from the burgeoning driverless vehicle market. That said, long-term investors should pay little attention to Wall Street's moves. Not only is the Street focused on the near term, but you'll get whiplash following the frequent changes in ratings and price targets. I've been bullish on NVIDIA since late 2016, when I started covering the stock, and my opinion remains that investors should buy NVIDIA stock. Even after Tuesday's boost, NVIDIA's current price offers an attractive buying opportunity, which might not last for long. NVIDIA isn't just a player in two markets that have been growing rapidly -- gaming and data center AI -- it's the leader in both of these markets. And with its many partnerships with top automakers, truck makers, and auto part and system suppliers, it's been positioning itself to be the leader in supplying the "brains" -- or AI -- for driverless vehicles once they become legal across the land. Investors don't have long to wait for material news, as NVIDIA is scheduled to report its fiscal third-quarter 2019 results on Thursday, Nov. 15, after the market close. Wall Street is expecting the company to turn in earnings per share (EPS) of $1.71 on revenue of $3.24 billion, representing year-over-year growth of 28.6% and 22.9%, respectively. NVIDIA has significantly beat the Street's earnings estimates for some time, and if it does so in two weeks, you can probably kiss goodbye your opportunity of buying the stock at about $200 per share. As always, the best -- or at least the safest -- way to buy a stock is to dollar-cost average your way into your full position. (That means investing the same dollar amount at some set time interval, such as monthly or quarterly.) Doing so assures you won't be buying all of your shares at the stock's high for a given time period.